Buffalo, New York – Reichert Technologies® is pleased to announce the launch of three brand new ClearChart® Digital Acuity Systems: ClearChart 4 Digital Acuity System, ClearChart 4X Enhanced Digital Acuity System, and ClearChart 4P Polarized Digital Acuity System. The all new family of ClearChart Digital Acuity Systems is all-in-one, elegant, simple to use, and uniquely designed to meet all acuity testing needs with a wide selection of optotypes and other special test charts. Optotypes include the following: 17 letter set, 8 letter set, Sloan, HOTV, Landolt C, Landolt C & O, Tumbling E, and Children’s Optotypes, among others. Some of the special test charts include astigmatic testing, fusion, phoria, and binocular balance. Optotypes can be isolated, increased or decreased in size, and displayed in LogMar, Snellen, or Linear progression. The ClearChart 4, ClearChart 4X, and ClearChart 4P all feature new 24 inch, high-resolution, LED backlit displays that are lightweight, cool running, and long lasting. The intuitive user interface, whether controlled from the Phoroptor® VRx Digital Refraction System or SightChek™ Digital Phoroptor, or by an easy-to-use infrared remote, provides the best user experience of any digital acuity chart. Requiring no separate components or software, ClearChart Digital Acuity Systems are free of moving parts, noisy fans, and spinning hard drives, providing silent, and dependable operation. ClearChart Digital Acuity Systems can be configured for standard or mirrored viewing to accommodate refracting distances from 6ft to 24.6ft (1.83m to 7.5m). ClearChart 4X and ClearChart 4P users have the ability to easily import images and videos to customize their digital acuity system by simply importing files from a USB drive. ClearChart 4X and ClearChart 4P also include ETDRS, contrast sensitivity, and patient education slides. Reichert ClearChart Digital Acuity Systems are built on Reichert’s legacy of innovation in acuity and refraction and are proudly made in the United States in Reichert’s state-of-the-art manufacturing facility and world headquarters in Buffalo, NY, USA. 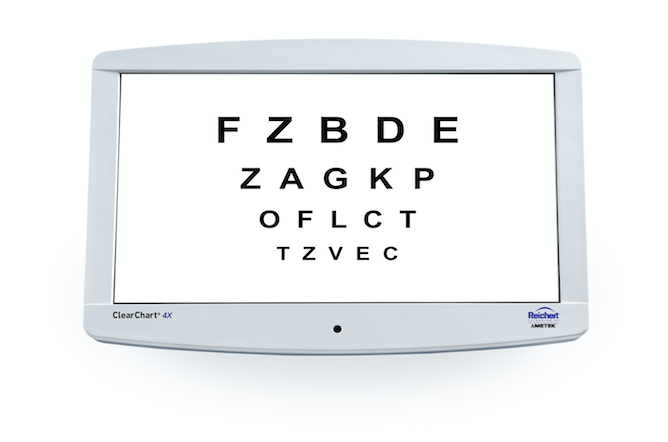 To learn more about Reichert’s new ClearChart 4 Digital Acuity Systems visit www.reichert.com/clearchart. Reichert Technologies, Buffalo, NY, has been a global leader in the design and manufacture of high-quality vision testing and eye care diagnostic devices for optometry, ophthalmology, and retail eye centers for more than 150 years. Inventors of the Phoroptor®, Lensometer®, and Non-Contact Tonometer, Reichert continues its American-made tradition by providing ground-breaking products, including the digital Phoroptor® VRx, Tono-Pen® Handheld Tonometer, ClearChart Digital Acuity Systems, and the revolutionary Ocular Response Analyzer® featuring Corneal Hysteresis. Reichert Technologies is a unit of AMETEK Ultra Precision Technologies a division of AMETEK, Inc., a global leader in electronic instruments and electromechanical devices with annual sales of approximately $4.0 billion.